Awesome - thanks for sharing! Great to see the actual layout come along. Thank you very much Jan for adding my You Tube link! It's appreciated and nice to get a lot more viewings on my channel. Keeps me motivated. A few more photo's today. I decided to extend the double tracks under the plywood so the turnout happens before entering the tunnel. That way I have a longer length of double track to park one train. I now have 10 relatively long pasenger trains and not many places to leave them on sidings. It means I can get my longest train with three locomotives and fifteen passenger cars, the Great Northern Empire Builder into one of the reverse loop sidings and out the way when not being run. I made a mistake in the planning phase so it meant I had to cut away the foam riser and glue in tunnel walls. I also had to glue the half cut risers back together after cutting them to hold it all in place and at the same time cut the hill section in half along the benchwork join line in case I ever have to move the layout. When it's dry, I'l put it back together including the plywood upper level and make another video running more trains. Was a bit difficult working around the wires and track but all good. The nice thing is it gave me the opportunity to use up more of my leftover Kato V16 curves so less waste. New video tomorrow or in a few days on the OsO Valley You Tube channel when I next get the opportunity. 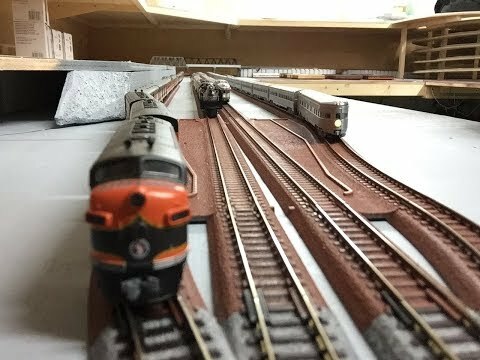 Posting new video shortly, last updates and running a few trains, discussing tunnel modification, LED lights, finalised yard etc. Probably last udate for at least 8 to 10 weeks, heading back to work and will be away for some time. Thanks for reading and watching the video. Just came accross photo's I took when I was experimenting with painting the Kato Uni Track. Essentially, I removed the entire section of furthest away part of the layout, which wasn't going to be easy to reach, kept it in two halves and then just sprayed it on a drop sheet in the garage. After letting the paint dry a little, perhaps ten minutes, just wiped the rails down with paper towel and paint thinner followed by a hard sponge with a fine grade sand paper on it just to catch any areas I missed. Once it was dry, clicked the track back into place. NOTE: The rail joiners and track that get paint on them will not conduct electricity when connected to the next section of track so it's important that the sections are painted in the same blocks you intend on having electrical drop wires. So, for example, the end pieces had insulated joiners on them anyway as those track sections are fed by normal drop wores from the DCC bus wire so didn't matter if paint obscured the joiner electrical contact. Once the track is completely dry, you could always take apart the sections again and add more drop wires. Just makes painting the rails easier. Obviously, the surrounding area of the track and ties will have to be balasted so ultimately, all you will see of the painted Uni Track ire the actual sides of the rails. I do plan on getting a toothbrush and gently brushing the ties between the rails with a little thinner to remove some extra paint. Reason being, I have a mixture of concrete and wooden effect track pieces so the "dirtier" I can make it all look, the better the pieces will blend in. I'll also paint the ties with various dirty colours to simulate or add in coloured washes for effect of oil spills, diesel fumes or areas where the locomotives would be working harder like on grades etc. I also think it will look better if the track looks slightly different all the way around the layout rather than completely uniform over different areas. Hopefully, I'll get it right. If you already have RailModeller Pro, I've made my layout available to download on the community layts section of RMP under N scale. Originally, the top deck was going to be Peco track but I've had such good results with the Kato track after messing around with it for the last few years that I redesigned the top deck with Kato Unitrack to match the lower deck. I've also made the design more mountainous. There are only four areas that do not use Kato track. Two are on the lower deck which will be a very early 1950's style intermodal yard with ramps at the end of each track and the roundhouse area (Walthers 130'). The top deck I've used flex track for a couple of bridges although on the plan the largest bridge actually shows three inline single track Kato bridges but I will build it with another style bridge, possibly Micro Engineering's bridge so of course I will not use Kato track on that section. The final bridge is on the top deck where there is a partial curved bridge which I may need scratch building but it's not too big. On my layout, the helix is 5 layers with 2% incline, 50mm (2 inches) clearance. Equally all inclines are 2% using Woodland Scenics risers and all bridge clearances 50mm (2inches) as per the helix. Anyway, feel free to download and build yourself or even modify my design and add it to the community layouts. We all have our own ideas and it's great for other railroaders to modify an existing design. One last thing, I haven't updated much here or on my YouTube channel for a long time because I'm still working away and my rotation onboard the vessel has been extended to mid April for logistical reasons. The good news is I'll get the full ten weeks off next rotation home which is a lot of train time!